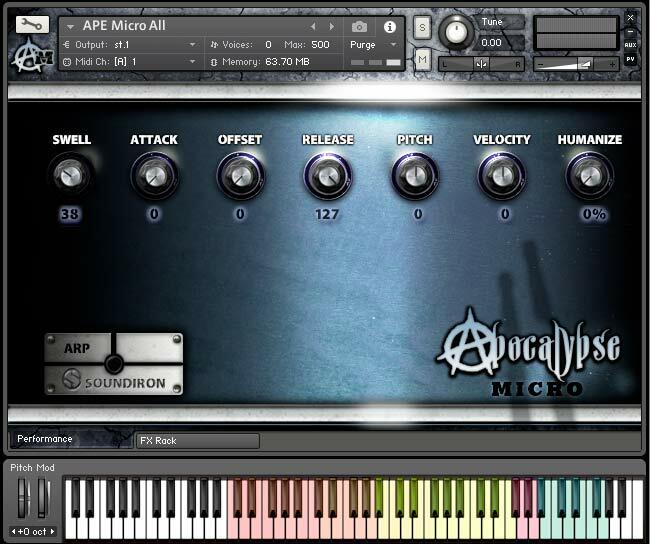 Apocalypse Percussion Ensemble Micro, or just A.P.E. Micro, is a virtual instrument featuring amazing cinematic drums in a simple and straightforward interface. It is the starter edition of the Apocalypse Percussion Ensemble library, a massive 25 GB library containing more than 40 drums and cymbals, in almost 200 different articulations. 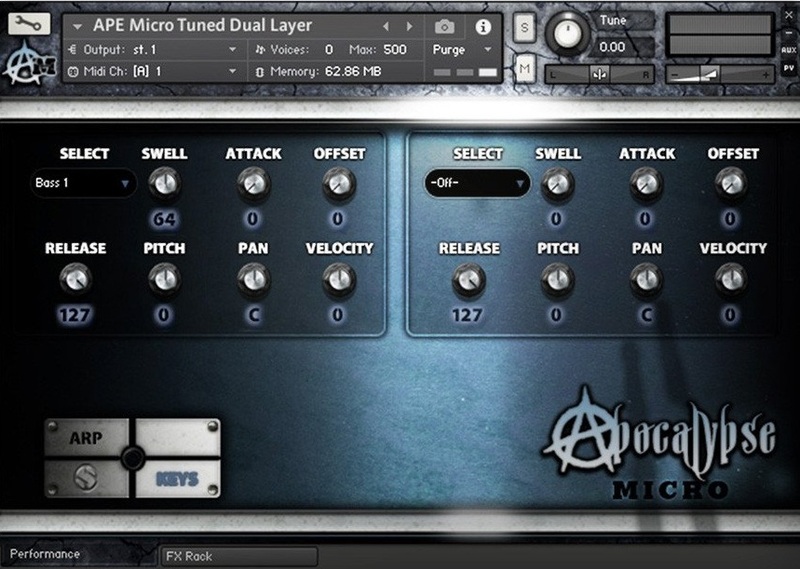 A.P.E Micro comes with three Instrument presets: All, Megamixer and Tune Dual Layer. Ape Micro All displays the full library mapped to the keys. This preset has global controls for Swell, Attack, Offset, Release, Pitch, Velocity, and Humanize. Swell will control the overall dynamic range, while Velocity will control the velocity attenuation. Humanize works as a randomization of velocity and volume. Offset will set the sample start, and finally, Attack, Release, and Pitch will set their equivalent parameters. 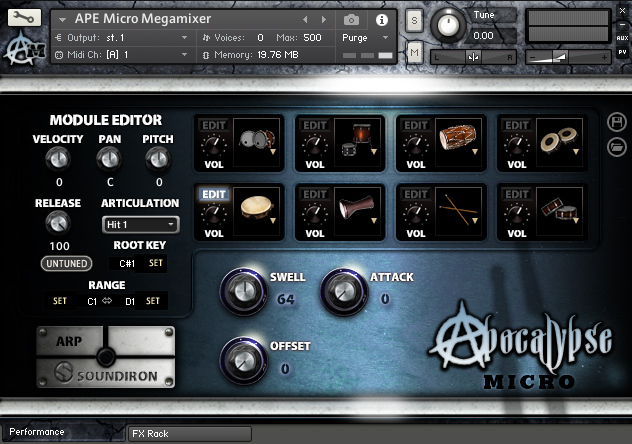 APE Micro Megamixer preset has eight slots (or layers) with independent settings for Velocity, Pan, Pitch, and Release. It’s also possible to choose different articulations fo each drum, as well as set their root key and range. Using the Save an Load buttons at the right, you can save any changes as new presets and load them whenever you want. This preset has global controls for Swell, Attack, and Offset. With APE Micro Tuned Dual Layer preset it’s possible to combine two articulations and play them throughout the keyboard. You can choose from the available 28 articulations and set independent parameters for Swell, Attack, Offset, Release, Pitch, Pan and Velocity. 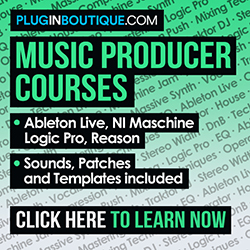 All presets comes with a built-in 32-step Arpeggiator, as well as an FX rack with 18 effect types, such as Chorus, Compressor, Delay, Reverb, Distortion, Flanger, Phaser, EQ, etc. You can save the arpeggiator settings so you can reload them in the future. As a native Kontakt feature, it’s possible to save any changes as new presets. APE Micro comes with 386 samples, with velocity variation, so that you can also import the samples into your preferred sampler. – Full Kontakt 5.5.2 or above required. 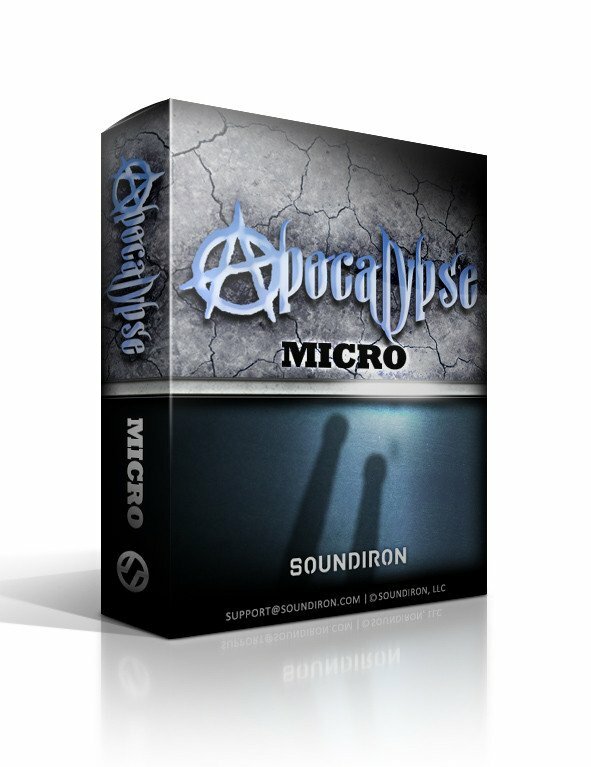 You can also purchase APE Micro on Plugin Boutique website.